The presence of nickel ore in southwest Oregon has been known for more than a hundred years but it wasn’t until the late 1940s that interest in these deposits escalated with notable spikes in exploration happening in the 1950s, 1970s, and 1990s. The following will help identify where these deposits are located in Oregon’s Illinois Valley, explain the geologic events that may have formed them, and outline a chronological history of nickel exploration in this region. The nickel ores in Illinois Valley are located in a relatively narrow band extending in scattered patches for about 20 miles with the southern end near O’Brien and the northern end near Selma. The deposits that have attracted the most attention are on Eight Dollar Mountain, Woodcock Mountain, and the ridge immediately west of O’Brien that some mineral reports call Rough & Ready Mountain. Yellow identifies the areas of laterites that have been most extensively explored in the region near Cave Junction, Oregon. Nickel claims in California are identified for reference. The Wimer Road fossil sites are on the left near the California border. Click image to see an enlargement. Nickel ores develop from decomposition of rocks uplifted from the upper mantle of the earth and the largest exposure of this type of rock in Oregon is found in Josephine County. 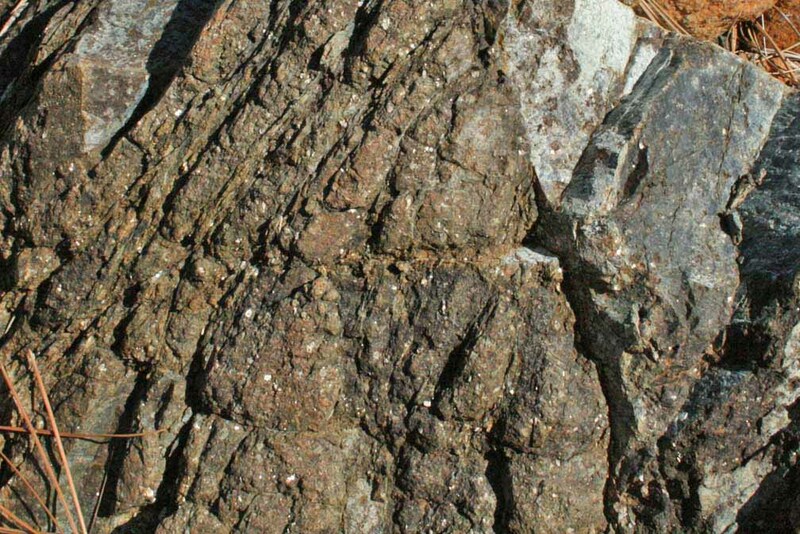 In historic literature these mantle rocks are called peridiotites and sometimes serpentine. Despite the extensive size of this outcrop, there are only a few places where ore deposits large enough to be of economic value can be found. 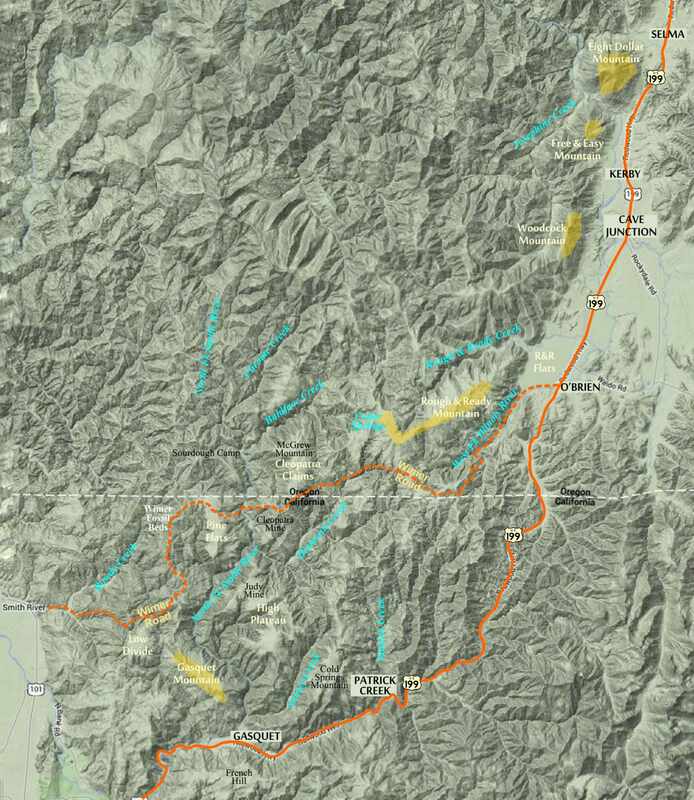 Some of these deposits are located in the mountains along the west edge of Illinois Valley. Nickel ore is created as rainwater decomposes the rocks of the upper mantle. Over long periods this decomposition works its way down leaving behind decomposed fragments of rock that continue to breakdown to form a soil that may become as deep as 10-20 feet or more. 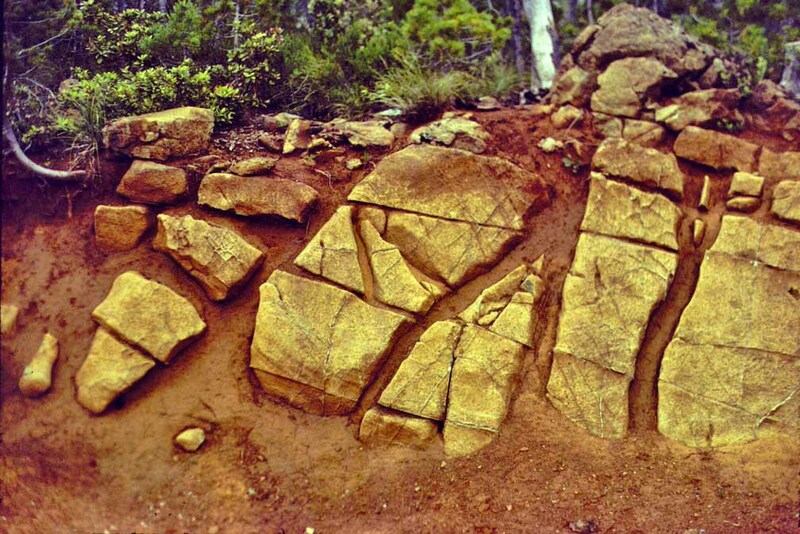 A typical lateritic soil contains four zones that are defined by progressive decomposition of the bedrock and concentration of minerals carried by rain water as it moves downward. 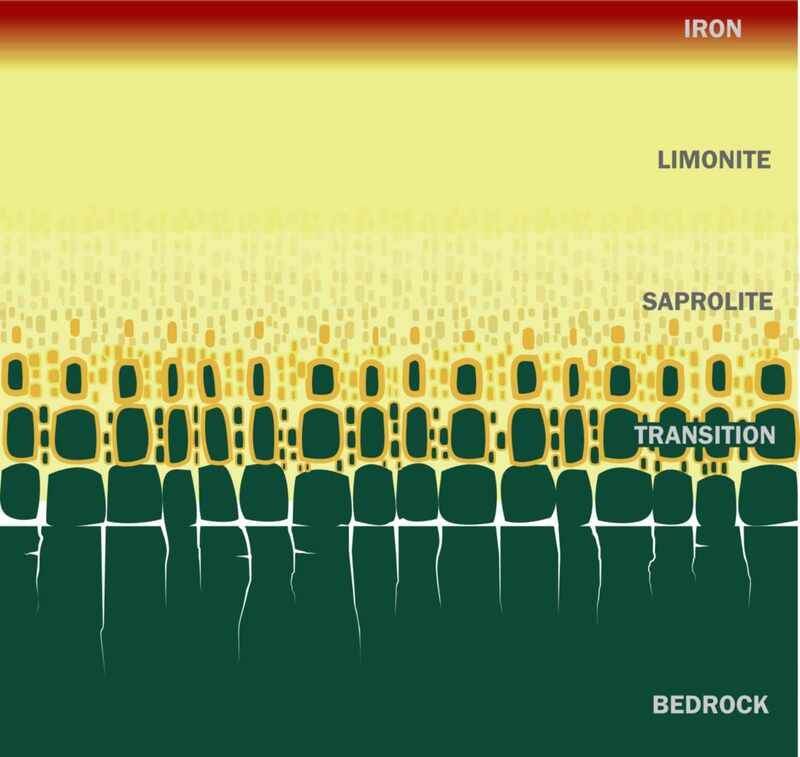 Water resistant iron typically is found at the top of the profile with silica and nickel carried down where it collects in the lower part of the profile to include cracks in the bedrock. The minerals of the decomposing rock react differently to the rainwater. Some are willingly picked up by water and over great spans of time move slowly downward to where they accumulate above the unaltered bedrock at the bottom of the soil profile. Other minerals resist being dissolved by rainwater and remain at the top of the soil profile. As this process continues, the soil becomes divided into separate zones with different concentrations of minerals. These layered soils are called laterites. Nickel and silica are more easily carried downward by water and tend to accumulate at the bottom of the soil. Iron is more resistant and remains at the top where it forms a red layer of rust. Other minerals, such as cobalt, form an intermediate layer. Quartz collects in cracks in the lower part of the laterite profile. As rocks decompose, they may leave angular openings in the quartz, which makes the quartz appear to be made up of empty boxes. This “quartz boxwork” is regarded by miners to be an indicator of nickel deposits. The mobility of these minerals is dependent upon the natural acidity of water, most commonly carbonic acid, that is formed when carbon dioxide mixes with rain water. This acid reacts with the minerals in the mantle rock, especially olivine, to create bicarbonates and release the nickel into the soil. The reaction takes carbon dioxide out of the atmosphere and converts it into bicarbonates that are common building blocks of limestone reefs and sea shells. 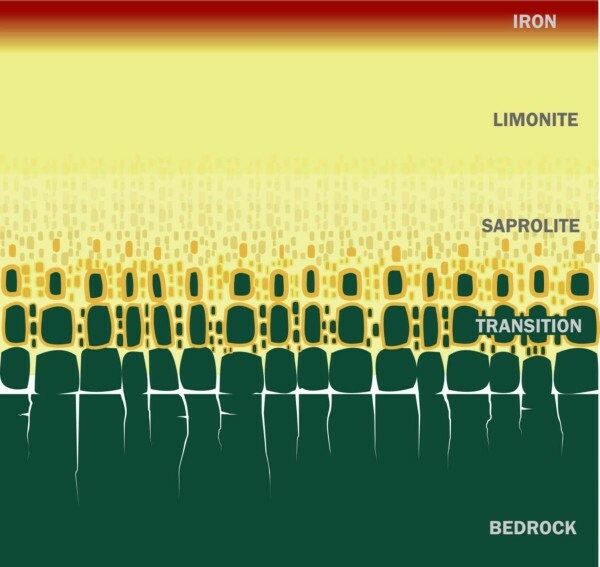 Using olivine-rich rocks as a solution to sequester carbon dioxide has been suggested as one strategy for reducing greenhouse gasses in the atmosphere (65). In tropical regions with high rainfall and warm temperatures, the process of decomposing rock and developing a layered soil to a depth of 30 feet is estimated to take about a million years (51). Exposures of upper mantle rock can be found in other parts of the world and many of these have developed thick layers of lateritic soils. About 70 percent of the world’s nickel resources are found in these laterites, most of which are in the tropics. The nickel ores in Oregon are considered to be unusual because of their location outside of the tropics. 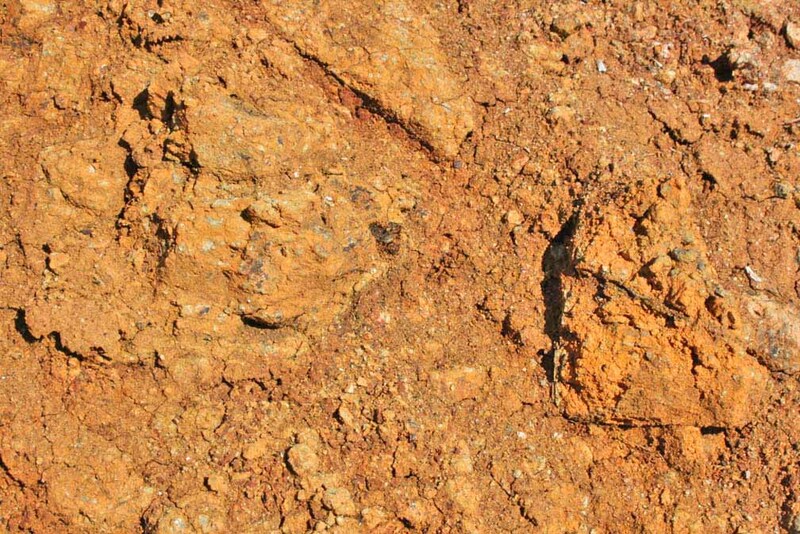 Some geologists who have examined the nickel ores of Illinois Valley regard these to be “fossil” ores or the remnants of what may have been a more extensive deposit that has since eroded away (2, 17, 55, 57, 71, 72). A look at recent geologic history might help to explain when these nickel deposits formed and what happened to reduce them to the remnants seen today. The laterites of Illinois Valley most likely began developing when this region was a relatively flat terrain about five million years ago (1). This terrain is believed to have extended to the coast and northward as far as the Roseburg (12). In historic literature this “flat lands” is called the Klamath Peneplain. Evidence of what this region’s climate may have been five million years ago can be obtained from plant fossils found in rock outcrops along the Wimer Road in the mountains about ten miles north of Crescent City. The fossils include magnolia and a species of avocado (12) and the association of ancient avocado trees with Magnolia provides evidence for the existence of climatic conditions similar to what is found today in the warmer and more humid areas of the Gulf States of Mississippi, Alabama and Georgia (75). An indication of how much the region has been uplifted over the past five million years can be found in another fossil bed closely associated with the plant fossils along the Wimer Road. This formation of rocks contains sea shells, which indicates this plateau at 2,500 feet elevation was at one time below sea level (12). The age of these fossil shells are about five million years (74). It appears that the forest of avocados and magnolias moved in and occupied the exposed ocean sediments as they were uplifted out of the sea. It is believed that these uplifted ocean sediments and the forest that covered it likely extended inland to include the area we know today as Illinois Valley (12, 57, 71). The relatively level ground of these flat lands and warm temperatures would have provided ideal conditions for development of laterites. The ores found on Rough and Ready Mountain, High Plateau, and McGrew Mountain (Cleopatra claims) may be remnants of ores that formed on the ancient Klamath Peneplain. After a long period of stability the region experienced an episode of uplift with the flat lands believed to have been tilted toward the northeast (13). This created a new drainage system including a river that ran from the area of today’s Illinois Valley toward the town of Galice. This ancient river is known as the “Old Channel”, a name given to it by miners who looked for gold in the gravel and cobble deposits that filled the bed of this ancient river. These deposits are located on the mountain slopes about 700 feet elevation above Galice and there are additional deposits of these river rocks perched in Swede Basin about seven miles north of Selma and another on a ridge above Six Mile Creek about seven miles east of Selma (13). The uplifted lands initiated a period of increased erosion and it is likely that most of the clay-like laterite soils that may have developed on the older flat lands were washed away. There was another long period of stability and during that time the surrounding terrain began eroding down with the “Old Channel” river likely playing a role in creating areas of relatively flat landscape. The laterites that are found on the tops and sides of the mountains along the west side of Illinois Valley are approximately the same elevation as the “Old Channel” deposits and may have developed during this period of stability. Finally, a third period of uplift occurred that lifted the “Old Channel” gravels and initiated a new period of erosion that has created the landscape we are familiar with today. As erosion carved away at the terrain, the soft lateritic soils that may have formed during the period of stability would have been easily carried away leaving behind remnants of what may have been extensive deposits. The laterites on Woodcock and Eight Dollar Mountain may be from this geologic time frame. Similar patterns of uplift and erosion are found at Nickel Mountain near Riddle, Oregon, where the nickel deposits are at an almost identical elevation with the deposits on Woodcock and Eight Dollar Mountain (57) supporting the theory that these sites may have been part of an extensive “flat lands”. This regional uplift is not unexpected considering Illinois Valley, along with all of western Oregon, is sitting on top of the Cascadian subduction zone, one of the largest fault zones in the United States. Sediments are scraped from the top of the ocean crust as it passes under western Oregon resulting in a buildup of material that slowly lifts the land. The present-day rate of uplift in the Illinois Valley is likely 0.1-0.2 millimeters per year (58). Over a span of five million years, this rate of uplift would be enough to lift the land 1,600 to 3,200 feet. The geologic history of this region indicates that this uplift may happen in cycles of active uplift followed by long periods of stability (97). Recent uplift appears to follow a similar pattern on a smaller scale. 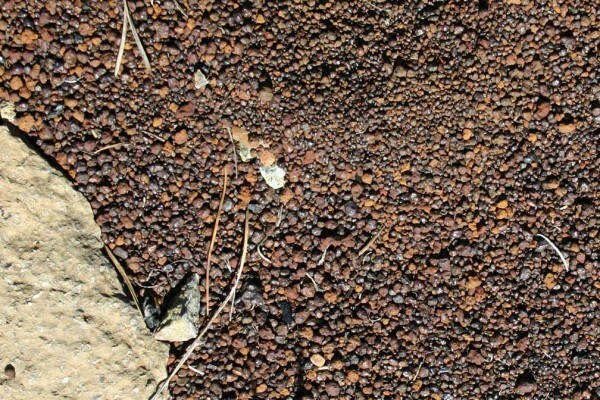 And example are the two gravel deposits on Josephine Creek. One of these is 30 feet above the current river and the other about 150 feet. Each is regarded to represent a period of stability and widening of the stream channel (96). Similar patterns of stability followed by rapid erosion can be seen in other areas such as along the Rogue River (98). The nickel ores found in this area appear to be remnants of what may have been more expansive deposits. In some locations, the quartz and nickel that likely accumulated at the bottom of the laterites are now found on the surface, a good indication that the soils have been washed away. Early investigations of these deposits noted the presence of rock in the laterites (2, 53, 69), likely the fragmented bedrock of the “transition” zone. 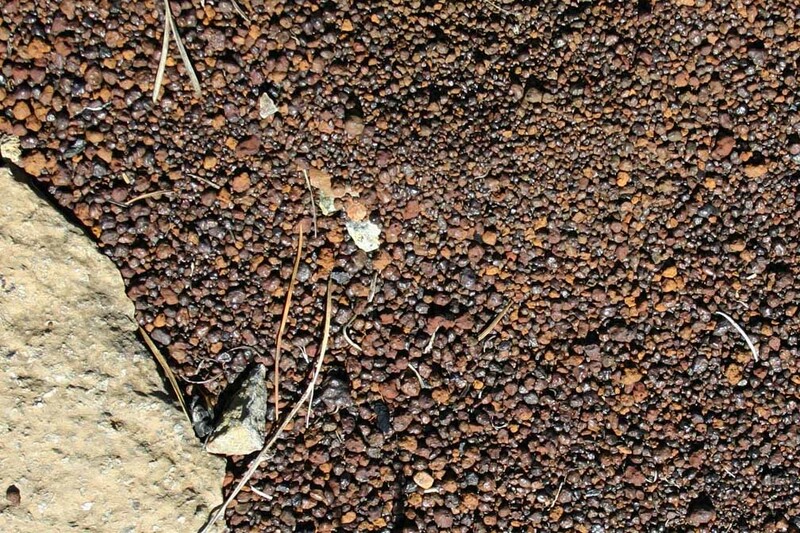 Iron deposits on the top of the laterite often deteriorate into a cap of pellets that local miners called “iron shot”. Some geologist regard the presence of these pellets to be the eroded remnants of ancient laterites. It can also be expected that much of the nickel that accumulated in these “fossil” laterites may have redissolved and washed away (17). This process of washing nickel out of quartz exposed at the surface can happen fairly quickly, in terms of decades rather than millenniums, as was observed in samples of old exploration pits on Nickel Mountain near Riddle, Oregon (57). Despite the promise of great mineral wealth being in this area, there is no indication that nickel mining was done here in neither the 1800s nor early 1900s. The reason for this might be found in a Geologic Survey done in southwest Oregon by Joseph Diller in 1914 (13). Diller did extensive and detailed on-the-ground research throughout the Klamath-Siskiyou Mountain region in the early 1900s (12) and expressed surprise at the lack of nickel ore despite the large exposures of mantle rock found in this region. Sometime around 1910, a man named Lewis made a map of nickel ores on Eight Dollar Mountain showing two ore zones that intersected northeast of the summit (68). This may have been the first mapping of nickel laterites in Illinois Valley. Eight Dollar Mountain (right) is a prominent landmark near Cave Junction, Oregon. Most of the nickel ore deposits are on the east slope, the side facing to the right. Free and Easy Mountain (left) was also explored for nickel. The first recorded interest in determining how much nickel might be in Illinois Valley laterite is found in a 1928 assay of ore from a chrome prospect on Eight Dollar Mountain. The assay called attention to the presence of nickel and determined the ore contained about a half of a percent of this metal (68). The Great Depression revived interest in mining and helped to fuel a spike in mining activity during the 1930s. This was especially evident in 1937 when local miners organized a mining promotion event called the Miners Jubilee. Articles and opinion columns in the local newspaper made claims of the vast mineral wealth of the area (81) and included articles with tips about how to find different minerals believed to be abundant in this region (82). This increased promotion of mining may have prompted owners of nickel claims on Eight Dollar Mountain to attract investors to open a nickel mine. A 1939 letter to the Oregon Department of Geology and Mineral Industries (DOGAMI) asking for the claims on Eight Dollar Mountain to be listed in the department’s publication, the Ore Bin was one of the first steps the owners took to promote the nickel ore as a potential mining prospect (14). The letter indicated the owner’s interest in cooperating with anyone who wanted to mine the claims. The following year, 1940, DOGAMI sent a representative to look at the claims on Eight Dollar Mountain (68). This may have been the earliest effort by the state to investigate the nickel ores of Illinois Valley. 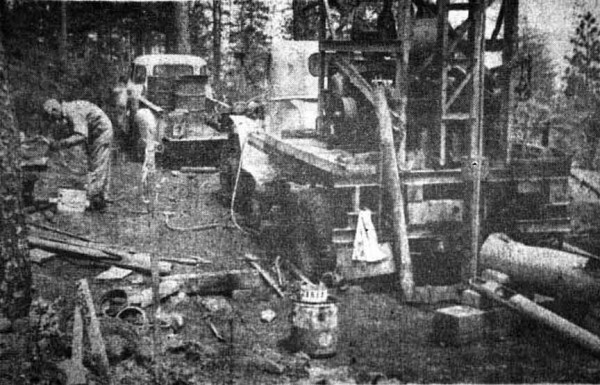 The first large scale nickel exploration in Josephine county was done on Eight Dollar Mountain by the Freeport Sulfur Company in 1942 (59, 61). They located claims and excavated discovery pits and shallow shafts to determine the extent of the ore. The Freeport Sulfur Company, was founded in 1912 at Freeport, Texas, with its primary investments being in gold and copper. In 1931 the company began to diversify and produced nickel during World War Two, which might explain why the company was doing exploratory work in southern Oregon in the early years of the war. Freeport is currently the world’s largest publicly traded producer of molybdenum and copper (78). In the same year, 1942, a representative from DOGAMI was sent to look at nickel deposits on Woodcock Mountain (69). 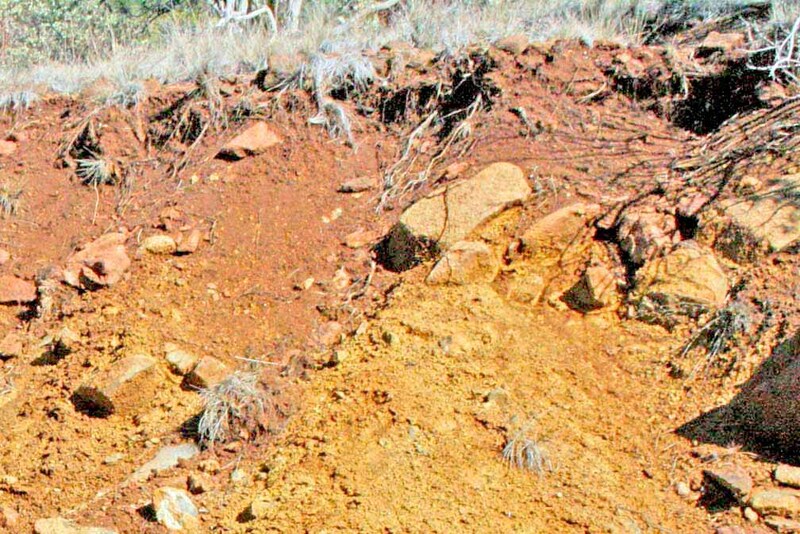 He noted that nickel ore, garnierite, was seen in the sides of exploration trenches but the “showing was very poor.” He pointed out that the ore deposits were on steep hillsides where fresh rock outcrops were visible at the surface, which he said indicated an unfavorable situation for the concentration of garnierite. A more comprehensive investigation of nickel laterites in southwest Oregon was done by DOGAMI in 1946 with a preliminary reconnaissance of ore deposits on Woodcock Mountain. Hand augering of core samples and mapping the laterites was done in 1948 with work continuing in 1949 (3, 15, 52). The Hanna Mining Company became interested in the area and in 1950 staked sixteen claims on Woodcock Mountain (3). It is uncertain what exploratory work was done. At the same time Hanna was also looking at deposits on Nickel Mountain near Riddle, Oregon and in 1953 the Hanna Nickel Smelting Company was formed and began mining and smelting operations at Riddle (77). At that time, Hanna Mining Company had its corporate offices in Cleveland, Ohio and was founded as an iron and coal mining company in the late 1800s. The interest in the nickel deposits of this region increased during the 1950s, likely due to a period of Government stockpiling of strategic minerals from 1951–1961 (77). There was also speculation that civilian demand for nickel would increase in 1960 and exploration that happened in the 1950s may have been the steps taken to build up ahead of this expected increase (24, 33). In, 1951, the Bureau of Mines sent a crew to Illinois Valley to look at the ore deposits on Woodcock Mountain. They augered 67 holes to a maximum depth of 22 feet and used a bulldozer to dig thirteen exploration trenches varying from 70-700 feet long and to a maximum depth of 23 feet. 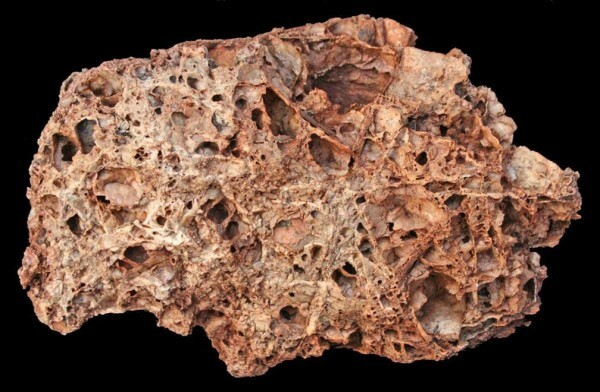 Their work concluded that Woodcock Mountain had nickel grades ranging from 0.14% to 1.10% nickel (2, 3, 63). 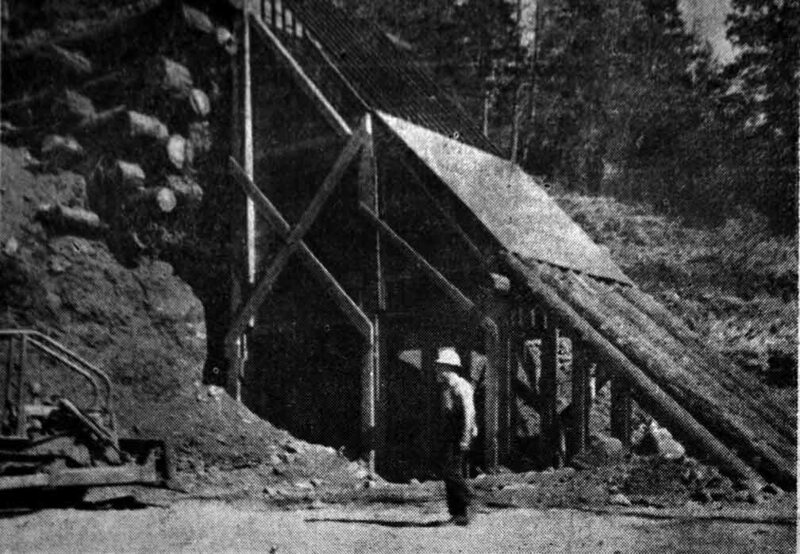 The Climax Molybdenum Company, a subsidiary of the Freeport Sulfur Company (now Freeport-McMoRan Company) explored the area in 1953 at which time they dug discovery trenches on Eight Dollar Mountain, likely in the same areas as was done by their parent company, Freeport Sulfur Company, in 1942. Ore samples were taken and ore deposits mapped (61). Early in 1954 plans were made for an aerial reconnaissance of Oregon’s mantle rock exposures for the purpose of disclosing the presence of nickel laterite deposits and establishing criteria to aid in the search for deposits of this type. The work was conducted under Project 665, Mineral Resources of Southwest Oregon, a project that was created under a cooperative agreement between the Bureau of Mines and the California-Oregon Power Company who jointly financed the project (2, 20). Activity continued in 1954 with DOGAMI doing claim evaluations on Rough & Ready Mountain (64) and producing a study titled Rough & Ready Mountain Nickel Deposits (72). The series of events concerns the activities of the Uranium Corporation of America (a Utah corporation), the Chemical and Metallurgical Enterprises Inc, (originally the American Leasing Co.), the New Delhi Mines Ltd. (a Canadian Company) and the Nickel Corporation of America. The issue was first brought to the attention of the department by a letter from the Denver regional office of Security Exchange Commission (SEC) on June 26, 1956. At that time Uranium Corp. was preparing to merge with Chem and Met and stockholders were given investment proposals involving nickel deposits located on Woodcock and Eight Dollar Mountains in Josephine County. A letter from Alexander McColl of Ontario, California on August 27, 1956 enclosed a clipping, apparently sent to him by Chem and Met as part of an invitation to purchase securities, in which several statements were made that tended to present the Woodcock Mountain deposits in too favorable a light with respect to the information currently available. In response to a query by the Oregon Corporation Commissioner’s Department, Chem and Met on September 6th indicated that they had merged with Uranium Corp. and were taking the necessary steps to qualify for doing business in Oregon, but that they did not contemplate offering any securities for sale in the state. The Corporation Commissioner’s office informed the department on April 18, 1957 that Chem and Met had registered as a foreign Corporation on January 4, 1957. The department was informed on April 17, 1957 that Chem and Met had merged with New Delhi Mines Ltd of Toronto, Canada and that a new operating company called the Nickel Corporation of America had been formed to carry out the work in Oregon. Investigation of standard references on corporations at the public library revealed that New Delhi is an established Mining company in Canada, with a 1934 charter granted in Ontario, and holding fairly extensive mining properties in Sudbury, Saskatchewan and Blind River. Apparently the consulting firm of Simard & Knight does work for New Delhi since they have the same street address. Bristol also informed the department that Lionel Simard would be in personal charge of the Woodcock Mt. exploration. A letter received from the Ontario Minister of Mines indicated that Simard & Knight were a well-known consulting firm in good standing. The status of Chem and Met was also investigated. No references in the standard lists of corporations could be found. The Denver SEC office in a letter dated April 29, 1957 stated that Chem and Met had no securities listed or registered on a national securities exchange, and that they had not sought to claim exemption under Regulation A for offerings of securities or that the company had filed a registration statement for offerings of securities under the Securities Act of 1933. In the same letter the SEC stated that on October 29, 1956 Uranium Corp stockholders had approved the sale of UCOA assets to Chem and Met in exchange for stock. Uranium Corp was voted out of existence in March, with final termination set for April 30, 1957. A letter was received from Dana Investment Co. of New York City on April 22, 1957 inquiring about the nickel deposits on Woodcock Mountain, Eight Dollar Mountain, Rough and Ready Flats and Thanksgiving Placer. On April 30 a long distance call from Dana Investment Co. was received. Dana was anxious to obtain all the information possible on Woodcock Mountain. In the course of the conversation it was learned that Nickel Corp was already on the ground and that Lionel Simard was in charge of the drilling. One churn drill was in operation and two more scheduled to start soon. It was also learned that Edward N.White is the President of New Delhi Mines Ltd.
Mason’s summary provides some insight into the series of events that ushered Illinois Valley into the most intense period of nickel exploration in the valley’s history. It is uncertain if John H. White, President of Chemical and Metalurgical Enterprises of Salt Lake (19) was related to Edward N. White, President of New Delhi Mines Ltd. (54) or what role Lionel Simard of Canada played in organization of the enterprise. It appears that these three were the main force behind bringing the Nickel Corporation of America to the valley. The exploration activities of 1957 may have been the closest the valley has come to having a nickel mining operation. In the spring of 1957, the Nickel Corporation of America (the New Delhi Mines, Ltd of Canada) began exploration work on Woodcock Mountain by churn drilling sixty holes with an average depth of 51 feet and maximum depth of 100 feet. Ore reserves calculated by Simard and Knight based on a grid of drill holes spaced 250 feet apart indicated there was about seven and a half million tons of nickel ore containing an average of 0.70% nickel on Woodcock Mountain with a potential maximum tonnage of 15 million tons (3, 63). Drill rig taking core samples on Woodcock Mountain near Cave Junction, Oregon. Illinois Valley News, May 23, 1957. Publicity about the Nickel Corporation of America began to appear in the Illinois Valley News in April, 1957 (19). The article quoted John H. White, president of Chemical and Metalurgical Enterprises Inc. of Salt Lake City and noted this firm was being joined by New Delhi Mines, Ltd of Toronto to form The Nickel Corporation of America. The article said that assay work had been done on more than 1,000 samples from Eight Dollar Mountain and Woodcock Mountain where the company planned to mine 700 acres and use a newly developed process known as hydro-metalurgical refining to extract ore. The Oregon State Legislators proposed a Minerals Resources Extraction Tax in the early part of 1957 that the residents of Illinois Valley opposed, apparently in support of the nickel mining corporation (19). The bill was dropped with the apparent outcome of paving the way for Utah and Canadian businesses to send money earned from Oregon mineral resources out of Josephine County without a mechanism to keep the money in the state or county. When the Nickel Corporation started its first drill rig operations on Woodcock Mountain in May of 1957 (21) the plan was to drill a grid of exploratory holes and use core samples to determine the size and extent of the ore deposits. The first holes were spaced 400 feet apart and after this series was completed, drill crews moved the drill rig between them and drill another series of holes at 200 feet, then 100 feet, and finally to 50 feet apart. It was noted that each drill could be operated by two men with another employee available to collect the materials taken from the holes and transport them to where the samples could be sent off to have assays done on them (21). The drill holes were about 100 feet deep (22). Wet weather hampered road building on Eight Dollar Mountain and it wasn’t until early June that the first drill rigs were able to start taking samples (25). Weather did not hamper drilling on Woodcock because of the presence of old logging roads that were used to get drilling equipment to the drill sites. Edward White of New York City and John H. White of Salt Lake City, both officials of the newly organized Nickel Corporation of America visited Illinois Valley in June and stayed for about a week (25). The newspaper quoted Edward White, the head of the New Delhi Mining Company, saying he thought Eight Dollar Mountain deposits were comparable to the rich deposits at Mystery Lake, Manitoba (26). The importance of nickel to the defense program of the United States as well as the defense of Canada was brought up in at least two newspaper articles (26, 27). This may have been done to call attention to the government stockpiling program. In June of 1957, Abbot Hanks from San Francisco set up an assay office in Cave Junction to process ore sample from Woodcock and Eight Dollar Mountains (27). Drill rigs were working on both Woodcock and Eight Dollar Mountains and ore samples were brought to this office to determine ore content and location of ore bodies. There was an anticipation that a lot of work would be done in this office as additional drill sites were marked off and roads bulldozed to the new drill platforms (28). Articles in the newspaper featured other possible minerals that might be mined to include cobalt (23) and iron (29). The iron content looked impressive with some samples yielding 20-30 percent iron or about 400 pounds of iron from each ton of ore. However, the article concluded that iron would not be worth processing. About mid July, drilling work had been completed on Woodcock Mountain and all four drills were moved to Eight Dollar Mountain with bulldozers working to make roads to drill sites. It was estimated there were 15 miles of road on Eight Dollar Mountain (30). At the same time in mid July, there was news that the Office of Defense Mobilization (ODM) was not planning to buy more nickel for the nation’s stockpile. This “stockpile” program had started in 1951 with the intention of building enough reserves to provide the United States with an annual supply of 220,000 short tons by 1961. The reason for closing the program early (June 28) was because of increased world production that had not been anticipated when the program began (84). At the time the “stockpiling” program ended in 1957, ODM had been paying 74 cents a pound for nickel but the demand for nickel in the foreign market put the value of nickel at prices ranging up to $1.70 per pound (31). The Nickel Corporation of America had anticipated selling nickel to ODM and when the program suddenly ended they wanted to sell the nickel from Illinois Valley in the foreign market. However, the Commerce Department refused to give them an export license because nickel was still in short supply in American markets. The Nickel Corporation of America asked a Congressman for help to convince the Commerce Department to issue an export license (31). The Congressman succeeded with getting the department to allow Nickel Corporation of America to move forward with negotiations with foreign buyers, apparently paving the way for a corporation from Canada to sell American mineral wealth on the world market despite the need of the metal in this country. The Nickel Corporation of America planned to start mining and processing in nickel ore 1959 (31) and the plans included construction of a processing plant north of Cave Junction. This plant would be capable of producing 30 million pounds of nickel annually from deposits on Eight Dollar and Woodcock Mountains. There was speculation that the processing plant would be as large as the Hanna plant at Nickel Mountain near Riddle if tests fulfilled expectations (33). The mine owners estimate they might employ about 750 workers (31). The processing plant would leach nickel from the ore rather than process it through a smelter that melted the ore out of the rock, such as was being done in Riddle. In late July, plans were made to set up a screening platform on Eight Dollar Mountain to test ways to separate rock from the clay-like soil that contained the nickel ore. It was noted that in any leaching process it is necessary to find out the proper mesh for screening of the materials and the amount of water that needs to be added to the solution before chemicals are introduced for the recovery of the metals (36). Construction began in early August (37). A screen structure for separating nickel ore from rock was set up on Eight Dollar Mountain to test ways to make this process more efficient. Illinois Valley News, September 20, 1957, Cave Junction, Oregon. An area about 200×150 feet was leveled (38) where the screening platform was built with the screening structure being approximately 45 ft high. The elevation was needed so materials dumped at the top could pass through “screens” that would separate the ore into grades of different sized ore (37). The screens included pipes welded together to create slots of different widths. The slots allowed the ore to fall through but had to be strong enough to handle the impact of large rocks that would roll over them when the ore was delivered by dump trucks. In late August, a newspaper article announced that cement foundations were installed for the testing plant (38). A local resident who worked at the screening plant thought that these foundations might have been for the truck scale they had at the site. A truck carrying ore and rock would pull up on the scale and be weighed before the ore was dumped into the screen platform. The rock rolled off the pipe screen and the ore fell through. Another truck of known weight was positioned under the screen and caught the ore. This truck went back to scale to be weighed along with its load of ore to determine how much ore fell through the screen. This was intended to find out how much ore could be separated through a screen plant and determine if changes needed to be made to the design. According to the local resident, the screening plant was nicknamed the “Grizzley” (73). A photo of the screening platform was printed in a September issue of the Illinois Valley News (42). The location of this screening platform is uncertain other than it was somewhere on the side of the mountain (73). A pile of logs on the mountain might be a possible location. Coordinates: 42.249202,-123.649652. The last of the drilling work was completed at the end of August making a total of 180 holes drilled on both Woodcock and Eight Dollar Mountains (39). These holes may have been about 80 feet deep on the average (40). The Hanks Company assay office in Cave Junction was planning to continue operations (39), likely in anticipation of trenching work planned on Eight Dollar Mountain. In early September, a bulldozer began excavating two open pit trenches on Eight Dollar Mountain that were spaced about 1,500 feet apart. The intention was to excavate a series of trenches parallel to one another over a plot of land about 2000 x 3000 feet in size (40). It was noted that nickel concentrations increased with depth of the trenches but didn’t say how deep the trenches were and what the percentages of nickel were being found or if garnierite was present. By the end of September, about 15 trenches had been excavated into the mountain. A photo of a man standing in one of trenches said it was 23 feet deep and about 100 feet wide (43). The article did not say if all of the trenches were this size. Information about the results of drilling and trenching were partially revealed in a 1975 DOGAMI publication titled Eight Dollar Mountain Nickel Deposit that noted the churn drilling done by New Delhi Mines Ltd. in 1957 had found the average depth of bedrock logged in a total of 113 holes was 9 meters (30 feet) with a maximum depth of 27 meters (90 feet). Bedrock is interpreted to be at the point assays drop below 0.40 percent nickel (61). By the end of September, 1957 an article declared that commercial mining of nickel in Cave Junction area should begin by 1959 or 1960 (41). However, after this point, news about nickel mining appeared to dwindle significantly. The only mention of nickel that was found in the local newspaper showed up in a May edition of Illinois Valley News in 1959 that noted John White had come to the valley with a geologist to visit California’s High Plateau, located in the Diamond Creek drainage immediately south of the Oregon-California border. An inspection of the area was made by air starting at Riddle and ending at Eureka to locate laterite deposits. White told the newspaper that his laboratory in Salt Lake City had started working on a new process of handling laterite ores that was being perfected and would lower the cost of processing the nickel deposits found in this region (44). Nickel exploration appeared to come to a standstill in the early 1960s but the nickel laterites were still regarded as an economic resource as is evident by the publication of an article in the a 1964 edition of the Journal of Economic Geology titled Nickeliferous Laterites in Southwestern Oregon and Northwestern California (17). An increase in exploration activity occurred in the mid 1960s, likely in response to increased demands during the Vietnam Conflict (1961-1975) (77). The first of these explorations was done by Falconbridge on Woodcock Mountain in 1965 but the nature and results of the work completed was not found. Falconbridge was one of Canada’s two largest producers of nickel at that time. Additional work on Woodcock Mountain was done in 1966 by Coastal to include reconnaissance mapping, sampling, and drilling approximately 25 holes to depths adequate to substantiate DOGAMI estimates of the amount of ore on this mountain. The work concluded there was over five million tons of nickel laterite averaging approximately 0.80 percent nickel in an area of about 400 acres (3). Coastal is a subsidiary of Hanna Mining Company (83). In 1969, the Canadian nickel industry was shut down by a prolonged series of labor strikes. At that time Canada had the largest nickel sulfide deposits in the world (7) and produced 48 percent of the world’s nicked (76). The strike caused a major shortage of this metal. Nickel prices prior to the strike was ninety three cents a pound but during the strike rose to seven dollars a pound, which is equivalent to 31 dollars a pound in today’s dollar (11). The 1969 increase in nickel value may have been what prompted Coastal to continue investigations on Woodcock Mountain in 1971 with additional drill holes, road improvements, installation of culverts, grader work, bulk sampling for metallurgical processing, and in-depth cobalt grade analysis and mill design (3). The “oil shock” of 1973 along with the recession that followed resulted in lower nickel prices as consumption dropped (11). In 1975, U.S. demand for nickel was further weakened by the termination of American military operations in Vietnam (76). It was under these conditions that nickel exploration continued through the late 70s and 80s. Exploration work was done in the Rough and Ready Creek area by Inspiration Development Company mainly during the period from 1973 to 1976 (62). The Inspiration Mining Company has its home office in Toronto, Canada. Photogeologic mapping of Eight Dollar Mountain was done using color infrared photos flown in 1973 (61). It wasn’t clear in the report who was doing this work. Several claims were filed in 1974 on relatively small exposures of laterite on a slope about 2,000 to 3,000 feet above Josephine Creek. These deposits are about a mile west of Woodcock Peak and on the slope west of the creek (99). The report on these deposits by DOGAMI did not indicate they were very promising. Nickel continued to be a topic of interest in the Illinois Valley News with the printing of a story in 1975 by Len Ramp, DOGAMI geologist, titled Nickel Exploration in Southwest Oregon (45). Ramp also noted that he had done some recent work on Woodcock Mountain to include reconnaissance sampling and mapping (63). In 1977, Inspiration Development Company did exploratory work on Eight Dollar Mountain that involved seismic surveying, mapping, back-hoe sampling, and trommel processing of large bulk samples to test upgrading techniques. The Federal Bureau of Mines also conducted reconnaissance sampling and bulk sampling of Eight Dollar Mountain and other southwestern Oregon laterites (85). A labor strike in 1978 at the International Nickel Company of Canada (INCO) reduced Canadian mine output by more than 40 percent (76). This strike helped accelerate major changes in nickel pricing beginning in 1979 when nickel became the seventh metal traded on the London Metal Exchange (LME), marking a major turning point in pricing of this metal. Today, nickel prices are set by the LME, rather than by the producers, thus making nickel a commodity whose price is driven by world supply and demand, irrespective of production costs (76). The nickel strike and shortage of this metal likely played a role in the acceleration of nickel exploration in southwestern Oregon during the late 1970s. A Bureau of Mines report noted that a Canadian-based company named Ni-Cal Developments Ltd., was doing exploration work on Gasquet Mountain in 1978. Gasquet Mountain is located near the town of Gasquet about 20 miles south of the California-Oregon border and was described as having one of the largest laterite exposures in this region. Work in this region was done under the corporate name of California Nickel, which was the wholly owned subsidiary of Ni-Cal Development, Ltd., of Canada. The company also held claims in nearby Rattlesnake Mountain and Red Mountain (both above the South Fork of the Smith River), and the area referred to as the Judy Claims (High Plateau), all in California (86). In June 1978, Ni-Cal turned its attention toward Eight Dollar Mountain starting with a visit by Jack White of Vancouver, British Columbia, the founder of Inter American Nickel Inc., a Canadian company incorporated in Nevada in 1978. It wasn’t clear if Jack White was related to Edward White or John White who had done work on Eight Dollar Mountain in 1957. Ni-Cal Developments was apparently a subsidiary of Inter American Nickel (56). Inter American Nickel planned to use a new electrochemical processing system to extract the mineral from the ores on Eight Dollar Mountain, a system that White claimed was self-contained and non-polluting. A prominent geologist with DOGAMI discounted fears of local residents about pollution of wells in the Eight Dollar Mountain area, saying the springs that feed wells flow from bedrock well below planned mining levels (9, 56). Details about the process and possible pollutants were apparently not made public by the company or DOGAMI. A sidelight of an article printed in the Oregonian noted that White’s company owns foreign patent rights to “the process being developed with federal money at Albany (56)”. White explained that U.S. patent rights will be in the public domain because a federal agency is doing the research. They may have been talking about the Siemens Process, developed in 1975 at the Bureau of Mines Research Center in Albany, New York (87, 88). The US Nickel Corporation did some exploratory work on Eight Dollar Mountain in 1978 drilling test holes, some of which were as deep as 118 feet but the majority being in the 20-to-40 foot range. The processing they intended to use on the ore was described in a Courier article that said “the clay would be scooped up, and the nickel, cobalt, copper, chrome and zinc, would be leeched out with ammonia. Magnesium, iron and silica would be left in the clay, which would be replaced and re-seeded (8).” They may have been talking about the Caron Process or Siemens Process, both of which use ammonia for processing. They didn’t explain how they were going to stabilize this processed clay when it was returned to the steep slopes where the ore was mined and what potential impacts might occur to water quality if high levels of nitrogen from ammonia and ammonia sulfate in the discarded clay were to leach into the water table. Both of these issues would understandably be a concern to land owners along the foot of the mountain. According to the Inter American Nickel Company, it would take at least three years to install a nickel processing plant in the Illinois Valley at an approximate cost of $100 million. They estimated that about 500 people eventually would be employed. A major concern was the amount of electricity necessary to operate a plant (9), which indicated they faced costly operation expenses. Around this same time, a group of concerned citizens formed an organization named Josephine Environment Matters (JEM) to do fact-finding about the operation and get answers to questions about how the mine might impact property value and water quality of wells (9). In August of 1978: reports indicated that the Siemens process would be used here and statements were made that the process created no problem with waste or noxious fumes. An article in the newspaper emphasized how this mining operation would create jobs and noted that “many good young people have to leave here because of lack of employment (46).” Mining company representatives also claimed that five to eight additional jobs could be created to support each direct mining job. There was no mention of how this mining operation might impact job development in other sectors of the economy. The Second Oil Crisis (1979-82), triggered by the revolution in Iran, resulted in a recession that began in summer 1981 and caused a significant decline in nickel consumption (76). In 1981, Ni-Cal turned most of its attention toward California laterite deposits on Gasquet Mountain and noted that mining on Eight Dollar Mountain didn’t look good at this time (47). The mining company estimated there were 36 million tons of mineable ore available on Gasquet Mountain within an area of about 8,000 acres (twelve square miles), enough to keep a mine in operation for 20 years (47). A 1984 Bureau of Mines report stated these 8,000 acres contained a demonstrated resource of 14.8 million tons averaging 0.75% nickel (83), about half as much as the company estimated. Ni-Cal proposed mining the 8,000 acres on Gasquet Mountain in increments of 120 acres at any given time with rehabilitation being a continuous process (47). Processing would take place at a proposed $250 million facility located on the mountain and would use a closed cycle, roast-leach-electrowin (RLE) system of extraction (47). The mining company estimated that production “would meet 70 percent of the country’s annual need for cobalt, 43 percent for nickel, and 60 percent for chromium”. The mining company also projected that payroll for workers was expected to be about nine million a year and would generate about three million in local tax revenues (for California) (47). In 1984 Ni-Cal Developments applied to the Del Notre County Planning Commission for approval to build a research facility and an 85-ton-per-day demonstration plant in the town of Smith River, California. The facility would be used to test an acid leaching process, called the “Ni-Cal Process” (48) that had been specifically developed to handle the type of laterites found on Gasquet Mountain. A subsidiary, Ni-Cal Technology Ltd., was formed to operate the facility and market the technology worldwide (83). The plant was approved by Del Norte County in February of 1985 but it is uncertain if the facility was built. Public concerns about how mining might impact the unique environment of Eight Dollar Mountain continued in 1986 and a newspaper article quoted district officials saying Eight Dollar Mountain should be an Area of Critical Environmental Concern (10). Preservation efforts appeared to be gaining traction. In 1987, Hanna Mining Company shut down its operations at the nation’s only nickel mine near Riddle, Oregon. It was reopened in 1989 by the Glenbrook Nickel Companyand in 1991, Glenbrook began importing lateritic ore from New Caledonia and built a special drying facility at Coos Bay, OR, to handle the imported ore (77). Dust from the drying facility raised concerns among local residents who filed a suit (79). Glenbrook Nickel decommissioned its mining and smelting complex at Riddle in 2000 (77) due to high cost of production and low nickel prices (11) and apparently has not operated since that time. The Glenbrook Nickel Company was a joint venture of Cominco American Inc and Cominco Resources International. Ltd (80). Cominco American is based out of the state of Washington. Some of the factors that likely contributed to the closure of the mine at Riddle along with an apparent drop in nickel exploration in Illinois Valley was the collapse of the Berlin Wall in 1989 that resulted in a sharp rise in Russian nickel exports (11, 76). As a result, very little new mining capacity was added from other sources until the late 1990’s (11). In the midst of this decline, an application was submitted in 1992 to patent several nickel claims known as the “Nicore Group” located on Bureau of Land Management and Forest Service lands on Rough & Ready Creek flats northwest of O’Brien. Patenting of public land provides a way for a miner to gain ownership of the land within their claim and is allowed under provisions in an 1872 mining law. The series of events that resulted in a judgment to make the claims null and void are best summarized in the hearings and appeals document produced in August 2010 (89). Information outlining the history of proposed nickel mining operations on this claim is outlined below reciting information copied directly from the hearings and appeals document (89). The claims in the Nicore Group were located by various persons between 1940 and 1992 and efforts to develop the claims by the current owner, Walter Freeman, and the Inspiration Development Corporation (IDC) had failed. In 1992, Freeman applied for a patent for 151 of the claims but the application had not been processed because Congress imposed a moratorium on the processing of patent applications as of October 1, 1994. In December, 1992, Freeman submitted a Plan of Operations (PoO) to the Forest Service with a proposal for how he intended to process the ore as follows: The ore would be initially dried, and then fed into a kiln to be roasted for additional drying, after which the ore is referred to as calcine. The calcine is continuously fed into an electric arc furnace (EAF), at approximately 120 tons of calcine per day, and slag and metal are periodically tapped from the EAF. The molten metal can be granulated or formed into shapes, and once cooled, it is ready for sale (89 – copied from footnote 5). The PoO was denied in 2000 and Freeman filed suit in the U.S. Court of Claims. The Court of Claims stayed its proceedings and remanded the case to the Department of Interior to determine the validity of the Nicore Group claims. The parties agreed that October 1994, the effective date of Congress’ patent moratorium, and October 2000, the date the PoO was denied, would be the dates used to determine validity. The Bureau of Land Management commenced the mineral examination and contracted with Western Mine Engineering (WME) to produce two reports; “Nicore Laterite Ore Processing,” (Oct 2004) and “Economic Analysis of the Nicore Project, Josephine County, Oregon,” (June 2004), which contains the economic analysis for the marketability date October 2000 prepared by the Center for Advanced Mineral & Metallurgical Processing, Montana Tech of the University of Montana. For sampling data, both parties rely heavily on exploration work conducted by IDC, when it leased or owned interests in the subject claims from 1971 to 1982. IDC’s exploration activity consisted of geologic mapping, seismic testing, rotary drilling, and excavation and sampling of several hundred backhoe trenches, which produced 1,217 ore samples and assays. Those assay results were set forth in a report prepared by Superior Western Corporation (SWC) for IDC (IDC Report), and shown on 11 maps of the claims as well. The Government checked and verified the accuracy of IDC’s work by sampling 77 of the original pits IDC had excavated. A total of 130 check samples were collected and assayed. The Government’s assay results showed nickel to be 1.2 percent lower than IDC’s, while the Government’s results for iron on average were 0.4 percent higher. The two sets of assay results were markedly different for chrome. Accordingly, the Government accepted IDC’s assays for nickel and iron for purposes of calculating those resource reserves, but rejected the assay data for chrome. The Government also rejected IDC’s bulk density calculations, which calculations are used to determine the total ore available by multiplying the estimated density by the estimated volume. The BLM concluded that none of the Nicore Group claims contained minerals of sufficient quality or quantity to constitute a discovery, that the minerals could not have been marketed at a profit, and that the land embraced by such claims was nonmineral in character. A challenge to the validity of the claims was issued in March, 2005. No additional information could be found about these claims or the outcomes of subsequent court decisions, if any were made. 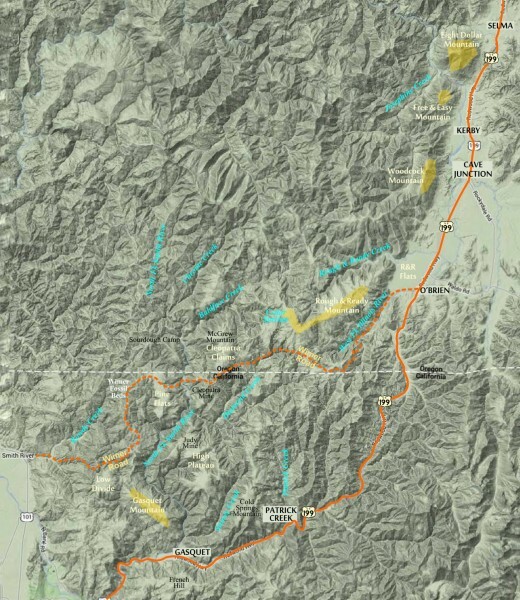 Articles about nickel exploration appeared to diminish from local papers until 2013 when the Red Flats Nickel Corporation proposed to do exploratory work on Hunter Creek near Brookings and on McGrew Mountain about 20 miles southwest of O’Brien, a group of claims known as the Cleopatra (92, 93, 94). A local resident who had looked up information on the Red Flat Nickel Corporation was quoted in an article saying it was a subsidiary of the English St. Peter Port Capital Ltd. that is registered in Panama and headquartered in the Isle of Guernsey, England (93). Photo taken from Wimer Road on Low Divide in California looks north toward McGrew Mountain where the Cleopatra Claims are located and High Plateau where nickel exploration has been done in the past. From the first years of nickel exploration in the Illinois Valley the world-wide demand for nickel has increased at an average rate of four percent per year. It can be expected that, for the present, most of the world demand will come from the tropics where thick laterites containing high percentages of nickel are found. This may be why it is estimated that the United States will be getting its nickel from these sources for at least the next 25 years (91). In the future, these resources will be exhausted and, as this transpires, there is no reason it can be expected that the interest in the nickel laterites of Illinois Valley will increase along with the pressure to mine them. As future pressure increases to mine the nickel laterites of southwest Oregon it can be anticipated that promoters of mining will highlight the economic and job creating virtues of mining. this is a pattern that is well documented in the historic records. However, the record also highlights a noticeable absence of calculations to determine how mining might impact the long term economic development of a community. There is no apparent effort to understand if creating mining jobs might result in a larger loss of jobs in other sectors of the economy. There is no apparent effort to look beyond the short term gains and understand what might happen to a community’s economic adaptability and resilience if resources that contribute to growth in other economic sectors are permanently consumed to support a short term mining operation. History provides abundant examples of the temporary nature of mining enterprises in Oregon’s Illinois Valley reaching back to the gold rush in the 1850s to the chrome boom in the 1940s. Mining has always been a boom and bust proposition and there is little reason to expect nickel mining to be any different. 2) Appling, R.N., Jr. 1955. A Reconnaissance of Nickel Deposits in Southwestern Oregon and Northwest California. U.S. Bureau Mines open-file report. 9) Courier, May 27, 1978. Eight Dollar Mining Won’t Affect Spring-Fed Wells. By Joan Howlett, Grants Pass, Oregon. 10) Courier, January 2, 1986.More Use Controls Urged for Mountain. Grants Pass, Oregon. 12) Diller, Joseph S., 1902. Topographic Development of the Klamath Mountains. US Geologic Survey Bulletin 196, 1902. Washington DC. 13) Diller, Joseph.S., 1914. Mineral Resources of Southwestern Oregon. U.S. Geological Survey, Bulletin 546, 1914. Washington DC. 15) Dole, H. M., , Libbey, F. W., and Mason, R. S., 1948, Nickel-bearing laterite areas of southwestern Oregon: Ore.-Bin, v. 10, no. 5, p. 33-38, May 1948. 17) Hotz, Preston E., 1964, Nickeliferous Laterites in Southwestern Oregon and Northwestern California. Econ. Geol. v. 59, No.3, May, 1964, p. 355-396. 18) Illinois Valley News, June 10, 1937. Mineral Deposits of Oregon: Quotes an article in the Evening Telegram of Portland, December 25, 1899. Cave Junction, Oregon. 19) Illinois Valley News, April 11, 1957. Operating Company Being Formed; Exploration Starts; Prospect of Plant as Large as One at Riddle. Cave Junction, Oregon. 20) Illinois Valley News, April 18, 1957. Bureau of Mines Reports Interest in More Mineral Developments Here, Cave Junction, Oregon. 21) Illinois Valley News, May 2, 1957. First Drill Rig in Operation on Woodcock Nickel Exploration; Job Going Ahead According to Schedule. Cave Junction, Oregon. 23) Illinois Valley News, May 30, 1957. Cobalt Will Be By-Product of Nickel Mining. Cave Junction, Oregon. 24) Illinois Valley News, May 30, 1957. More Nickel for Civilian Uses. Cave Junction, Oregon. 25) Illinois Valley News, June 6, 1957. Drilling Started on Eight Dollar; Officials of Nickel Company Here. Cave Junction, Oregon. 26) Illinois Valley News, June 13, 1957. Head of New Delhi Pleased With Exploration Work; Compares Area With Rich Mystery Lake, Manitoba. Cave Junction, Oregon. 27) Illinois Valley News, June 13, 1957. Welcome Nickel Corporation. Cave Junction, Oregon. 28) Illinois Valley News, July 4, 1957. Nickel Drilling Results Meeting Early Estimates, Cave Junction, Oregon. 35) Illinois Valley News, July 25 1957. Portland Paper Reported Nickel Here in 1899. Cave Junction, Oregon. 37) Illinois Valley News, August 8, 1957. Start Building Small Testing Plant for Nickel. Cave Junction, Oregon. 38) Illinois Valley News, August 15, 1957. Taking Out First Ore Samples for Testing Plant. Cave Junction, Oregon. 39) Illinois Valley News, August 29, 1957. Drilling Done For Nickel Here; 180 Holes Down, Cave Junction, Oregon. 40) Illinois Valley News, September 12, 1957. Nickel Content of Eight Dollar Ore Equal to Cuban, Engineer Reports, Cave Junction, Oregon. 41) Illinois Valley News, September 20, 1957. Nickel Mining to Start Soon Manley Reports. Cave Junction, Oregon. 42) Illinois Valley News, September 20, 1957. Eight Dollar Testing Plant. Cave Junction, Oregon. 43) Illinois Valley News, September 20, 1957. Open Pit Mine Trench on Eight Dollar. Cave Junction, Oregon. 45) Illinois Valley News, July 17, 1975. Nickel Exploration in S. W. Oregon. Cave Junction, Oregon. By Len Ramp, Geologist, Oregon Department of Geology and Mineral Industries. 46) Illinois Valley News, August 10, 1978. What Changes Are In Store for Eight Dollar Mountain? Cave Junction, Oregon. 47) Illinois Valley News, July 23, 1981. Mining Looks Good At Gasquet – Not So on Eight Dollar. Cave Junction, Oregon. 48) Illinois Valley News February 28, 1985. Del Norte Okays Ni-Cal Plant, Cave Junction, Oregon. 52) Mason, Ralph S.1949. Exploration of Nickel-bearing Laterite on Woodcock Mountain, Josephine County, Oregon. The Ore-Bin, Vol. 11, No. 3, 1949, pp. 15-20. 53) Mason, Ralph, 1949. Laterite Investigations. Oregon Department of Geology and Mining Industries, March 15, 1949. 57) Pecora, W.T., and S.W. Hobbs, 1942. Nickel Deposit Near Riddle, Douglas County, Oregon. U.S. Geological Survey, Bulletin 931-1, 1942, pp. 205-226. 59) Ramp, Len and Norman V. Peterson, 1979. Geology and Mineral Resources of Josephine County, Oregon. Oregon Department of Geology and Mineral Industries, Bulletin 100. 60) Ramp, L., 1978. Investigations of Nickel in Oregon.Oregon Department of Geology and Mineral Industries, Miscellaneous Paper, 20, 1978. 82) Illinois Valley News, July 7, 1937. Activities in Mining: Platinum and the Platinum Group Metals. 87) Siemens, R.E., 1975. Recovery of Nickel and Cobalt from Low-Grade Domestic Laterites. Bureau of Mines Report of Investigations, 1975. 89) Department of Interior, 2010. U.S. v. Walter B. Freeman, 179 IBLA 341. Office of Hearings and Appeals, Arlington, VA.
91) Keck, Peter, 2011. Nickel. Bureau of Mines / Minerals yearbook metals and minerals 2011. Geologic Survey, Department of Interior.